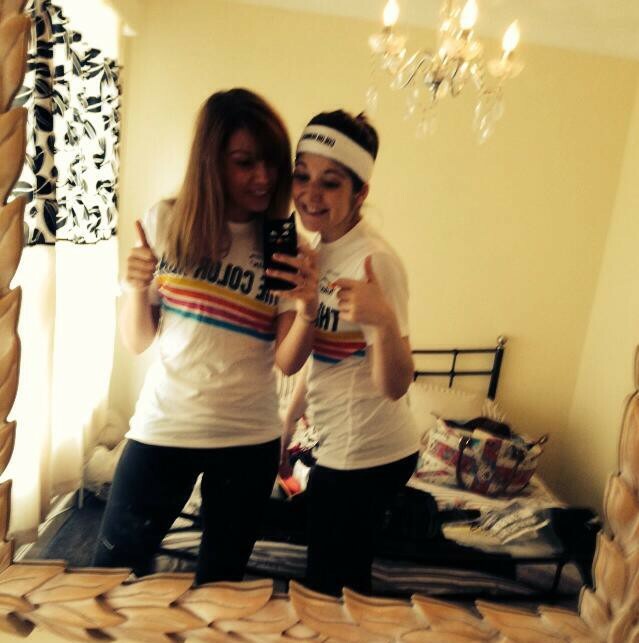 This weekend, armed in our white color run t-shirts, headbands (ok, me on my own!) 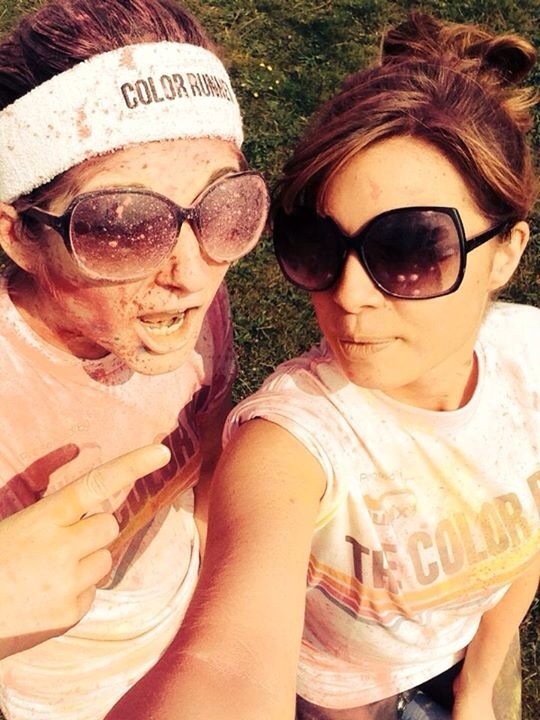 and sunglasses, looking a tad like 118, Jen and I took part in the Color Run in Brighton. Saturday morning we graced the earth with our presence, had a nice healthy breakfast and got ready to be coloured! Jen’s mum kindly took us into Brighton centre, to Madeira Drive, which is along the sea front where the race was being held. Jen and I made our way to the start, excitement bubbling, limbering up and watching a crowd doing the warm up (we were a little late to join in but also it was pretty hot and we didn’t want to get too sweaty before our run :P). The warm-up was being held by a Virgin Active instructor and looked real fun! Everyone then started moving into the start chute. They let waves of people go as to not be too crowded around the course and avoid overcrowding at the colour sections. We made our way into the start area waiting for our turn to be ‘go, go, go’! 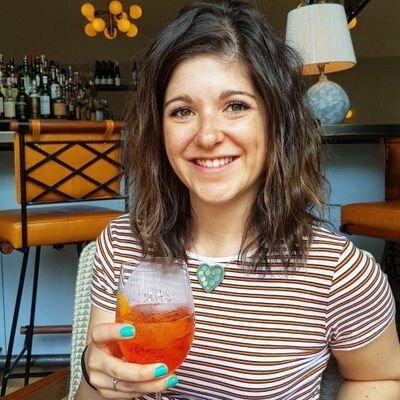 We were all bopping to the beats, chanting when instructed and the volunteers or colour run marshals were throwing freebies to some of us waiting – tutus, wristbands, sunglasses. We joined the countdown and off we were. It wasn’t a race and everyone was going their own pace, some walking, some jogging, and there were people of all ages, even little children taking part with their parents. It was so nice to see everyone coming together. 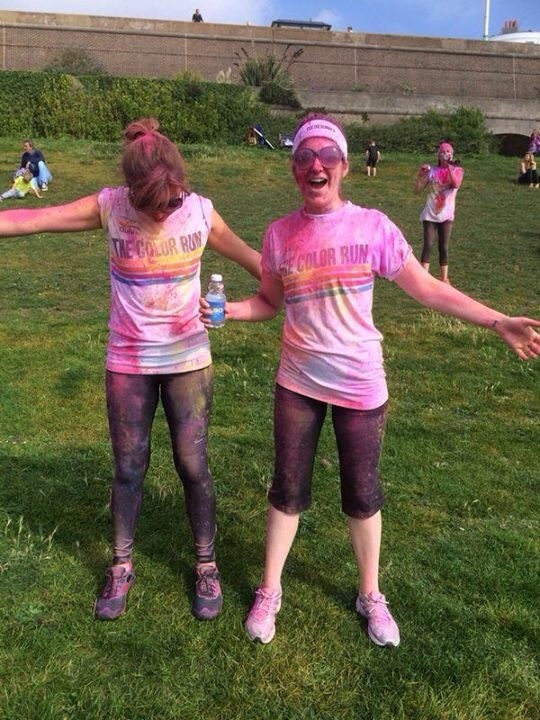 Jen and I took a steady jog, slowing down slightly at the coloured sections where they had volunteers loaded with powder paint in squeezy bottles briefed to cover you in colour! It was so much fun – pink, blue, yellow and orange. Towards the end people were even rolling on the floor to be brighter! So funny. You did have to alter your breathing slightly, a little shallower with all the dust and powder, but the sections werent too long for it to be a problem! The course even had a water stop half way round, which was great in the heat – it was so sunny saturday morning. The view was fab, running along the seafront and it was so well organised! 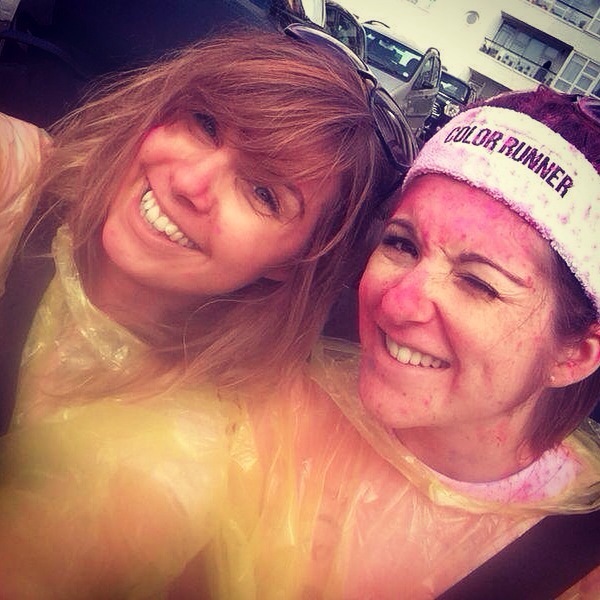 When we got to the finish line we were given a packet of powder paint and made our way in to the finish area where people were colour throwing and dancing to the music. There were timed colour throws too which looked awesome from the outside (our other housemate was watching from the hill). Jen and I opened our sachets and attacked each other with pink! We went to meet back up with Jen’s mum and Meg, and we all headed off for a refreshing drink before going back to clean off. 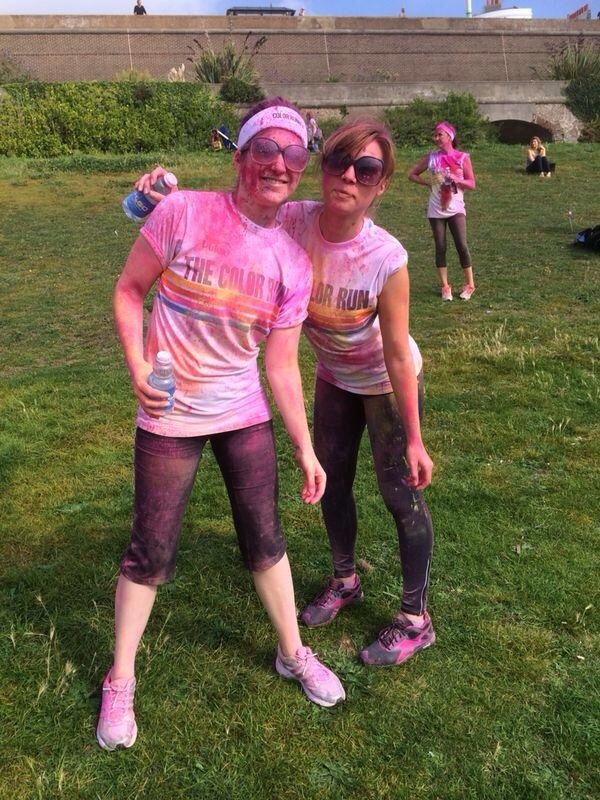 An amazing morning, SO much fun – they really do mean it when they say #colourmehappy !! Jen and I in our Rain Ponchos in the car on the way home – Got to protect the mini! Still smiling from our morning running. I’m definitely getting signed up for it again next year! P.s I know I spelt it Color – It’s a trend which has come over from America! I know it’s monday but I am still on the ball.